Welcome to This Date in Aviation History, getting of you caught up on milestones, important historical events and people in aviation from April 4 through April 6. April 4, 1957 – The first flight of the English Electric Lightning. When the Cold War began in 1947, the militaries of the world were still fighting with a World War II mentality, despite the recent arrival of the jet engine. The intercontinental ballistic missile was still 10 years away, and the long-range bomber remained the primary means for delivering nuclear weapons. Defense against these nuclear-armed bombers relied on the use of interceptor aircraft. An interceptor of the 1950s was essentially a missile-armed fighter that could fly at great speed to meet the incoming bombers and shoot them down as far away as possible from their intended targets. As there was no expectation that the interceptor would have to engage in a dogfight with other fighters, extreme maneuverability was sacrificed for all out speed. In 1947, the British Air Ministry issued Specification ER.103 which called for an experimental research aircraft that would be capable of Mach 1.5 and a ceiling of 50,000 feet. W.E.W “Teddy” Petter, the man responsible for the remarkable Canberra bomber, led the design team that created the English Electric P.1, a twin-engine interceptor with a radically swept wing. Initially, the P.1 had a wing swept to 40 degrees, but that was then increased to 60 degrees. Since nobody had ever built an aircraft with such a highly swept wing, Short Brothers (better known as Shorts) was hired to build the SB.5, which had wings that could be moved on the ground between 50, 60 and 69 degrees of sweep, and also allowed engineers to evaluate different tail configurations. Designers ultimately settled on 60 degrees and a low horizontal stabilizer. But the innovation of the P.1 was not limited to extreme sweep of the wings. English Electric also took the unique approach of stacking the engines one atop the other, rather than the more traditional method of placing them side by side. This arrangement kept the fuselage as narrow as possible to reduce drag. The first developmental aircraft, the P.1A, took its maiden flight on August 4, 1954 and, even without afterburners (or “reheating,” as the British call it) the P.1A officially reached Mach 1 just one week after its first flight, though analysis of testing data showed that it had actually broken the sound barrier on its first flight, but a misaligned Mach meter failed to indicate the correct speed. The next step in the development of the Lightning was the P.1B, which featured new Rolls-Royce Avon reheating turbojet engines. Now the Lightning showed its true speed potential, reaching Mach 2 and becoming the world’s first aircraft capable of supersonic flight without the use of afterburners, known as super cruise. However, that speed came at a cost. The Lightning was a very thirsty aircraft, and the length of many of its missions was determined simply by the amount of fuel it could carry. The Lightning entered RAF service in 1960, and soon took on its intended role by intercepting high-flying Russian bombers such as the Tupolev Tu-16, Tu-22 and Tu-95 as they probed the edges of British airspace. With such tremendous power coming from the Avon engines, the fighter could reach an altitude of 36,000 feet in less than three minutes, and though its official ceiling was a closely guarded secret, sorties were flown to intercept the Lockheed U-2 spy plane flying as high as 65,000 feet. Understandably, this capability was also kept secret. The Lightning was armed with two 30mm ADEN cannons, along with hardpoints both over and under the wings and on the fuselage for mixtures of missiles, rockets or bombs. Cameras could also be housed in a ventral weapons bay. While the RAF was the primary operator of the Lightning, a number of the 337 aircraft produced were exported to Kuwait and Saudi Arabia. The RAF retired their Lightnings in 1988, but a small number of aircraft remain flying in the hands of private pilots. April 4, 1917 – The first flight of the SPAD S.XIII. When WWI broke out on July 28, 1914, the airplane was still in its infancy. The Wright Brothers first flight had taken place a mere 11 years earlier, and military planners were only just beginning to discern a role for airplanes in combat. Initially, they were used solely for reconnaissance, but the crews of scout planes soon began taking pistols and rifles into the air to take shots at enemy aircraft, and the concept of the dedicated fighter plane soon followed. Development proceeded apace and fighters were soon being produced by all the belligerents in the war, and one of the greatest of those was the SPAD XIII. The SPAD XIII (the acronym SPAD ultimately came to stand for Société Pour L’Aviation et ses Dérivés) was a development of the earlier, highly successful SPAD S.VII but, by 1917 the S.VII was outclassed by newer German designs. In response to the calls for higher speed, engine manufacturer Hispano-Suiza raised the compression on the water-cooled V8 to create the 8A, and this 180hp engine was first used in the X.III. Later, the improved 8Be provided 220hp, and gave the fighter an impressive rate of climb and a top speed of 135 mph. The S.XIII proved to be faster than its contemporaries such as the British Sopwith Camel and the German Fokker D.VII, and could outclimb them as well. Though the geared engines proved to be somewhat unreliable, the Allies considered it a price worth paying when when weighed against the S.XIII’s increased performance. Subsequent development of the engine, and improved construction methods, helped improve reliability. The S.XIII was also larger than its predecessor, and its armament was doubled by the fitting of two Vickers machine guns in place of the single machine gun of the earlier fighter. Following its first flight, the S.XIII was quickly introduced to frontline units the following month. Though deliveries were slow, the SPAD S.XIII eventually outfitted a total of 74 squadrons (Escadrilles), nearly every combat unit in action at the time. Fifteen of the sixteen American squadrons fighting in WWI flew the S.XIII, including the 94th Aero Squadron, better known as the Hat-in-the-Ring Squadron, where Eddie Rickenbacker, America’s top ace of the war, notched 26 confirmed victories, many coming at the controls of an S.XIII. The US and French were the primary users, but S.XIIIs also served with the Royal Flying Corps and the air forces of 16 other nations. Nearly 8,500 were produced, and an additional 10,000 more were slated for construction at the end of the war, but those orders were canceled following the Armistice. Despite the development of newer, more advanced fighters in the latter stages of the war, the S.XIII remained in service with the US until 192o, and with France until 1923. April 6, 1938 – The first flight of the Bell P-39 Airacobra. At the beginning of WWII, the Bell P-39 Airacobra was the principal fighter aircraft in US Army Air Corps service. But the Airacobra often gets criticized as ineffective when with compared with later fighters such as the North American P-51 Mustang and Republic P-47 Thunderbolt. The Airacobra’s lack of a turbo-surpercharger certainly rendered it ineffective as a high altitude interceptor or fighter, but despite the criticism, the Airacobra was still a very effective warplane, and proved its mettle against ground targets and low-flying bombers, particularly in the hands of Soviet pilots. In 1937, the USAAC issued the most ambitious requirements to date for a new fighter. They called for 1,000 pounds of heavy armament including a cannon, a tricycle landing gear, a level airspeed of at least 360 mph and a climb rate that could attain 20,000 ft in less than six minutes. The requirements also called for a turbo-supercharged Allison engine for high-altitude performance. With all the weaponry the Army requested, particularly the large cannon, Bell had to find a way to fit it all inside the airframe. So they decided on the innovative solution of placing the engine behind the pilot, with a drive shaft that passed under the cockpit and turned the propeller through a gear system. The placement of the engine helped with the fighter’s center of gravity and, though some pilots voiced concerns about the drive shaft running underneath the seat, the system proved safe and reliable. With the engine placed behind the pilot, the nose of the Airacobra was empty. So Bell filled it with 37mm M4 cannon, a weapon specifically designed for the Airacobra and manufactured by Oldsmobile. Because of its heavy recoil, the cannon had to be placed on the aircraft’s centerline, and it fired through the center of the propeller spinner, an arrangement that was made possible by having gears drive the propeller rather than a solid prop shaft. In addition to the cannon, the Airacobra was armed with two .50 caliber machine guns in each wing and two more in the nose firing through the propeller. When testing of the XP-39 prototypes commenced, initial speed results were disappointing. The Army ordered that the aircraft be evaluated in a National Advisory Committee for Aeronautics (NACA) wind tunnel to see if the fuselage shape could be made more streamlined to increase speed, and it was here that the history of the Airacobra took a significant turn. The turbo-supercharger for the Allison V-1710 V-12 engine was cooled by a scoop on the left side of the aircraft, and NACA said the ducting had to be redesigned to eliminate the scoop to reduce drag. However, there was simply no place to move the scoop in the tightly packaged fuselage. So Larry Bell made the controversial decision to continue development of the P-39 with the turbo-supercharger removed, instead using only a single-stage supercharger. While speeds did increase with the improved aerodynamics, the lack of the turbo-supercharger effectively limited the Airacobra to service below 12,000 feet, rendering it ineffective as an interceptor or high-altitude fighter. And, once armor plating was added, the weight increase put a further drag on the Airacobra’s performance. Nevertheless, the P-39 was sent to the Pacific following the outbreak of WWII, where it proved to be a potent weapon against enemy ground targets and shipping. The Airacobra also saw service in the Mediterranean, notably with the Tuskegee Airmen of the 99th Pursuit Squadron. The British found the Airacobra almost wholly unsuited to their needs, and only outfitted a single squadron with the type. The rest they sent to Russia. And it was in Russia where the P-39 found its greatest success. The Russians appreciated the heavy firepower provided by the cannon and machine guns, as well as the Airacobra’s rugged construction. They particularly liked the Airacobra’s reliable radio. Nearly half of the 9,588 P-39s built were shipped to Russia, where Soviet pilots used the Airacobra primarily in the air-to-air role. Its heavy armament was particularly lethal against German bombers, but it could also hold its own against German fighters at lower altitudes. Russian pilot Alexander Pokryshkin scored 47 of his 59 victories in an Airacobra, making him the highest scoring P-39 pilot of the war. 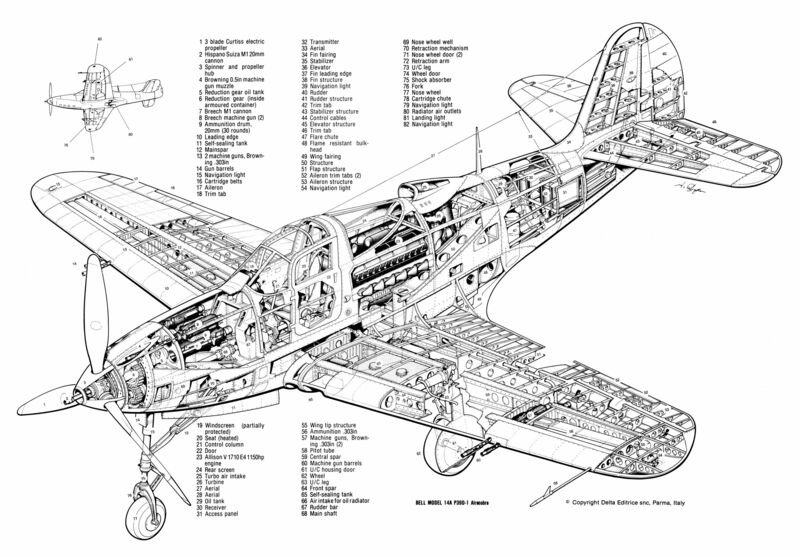 The Airacobra was continuously developed throughout WWII into a myriad of variants, including an attempt at a navalized version called the XFL Airabonita, and the larger, more powerful P-63 King Cobra, which was adopted by the Soviet Air Force. April 4, 1983 – The launch of Space Shuttle Challenger on STS-6, the sixth launch of the Space Shuttle program and the maiden flight of the Challenger. During the 5-day flight, astronauts deployed the first tracking and data relay satellite (TDRS-1), and conducted the first spacewalk from a Shuttle, employing the new Extravehicular Mobility Unit (EMU) spacesuit for the first time. STS-6 was the last Shuttle flight with a four-astronaut crew which consisted of Paul Weitz, Karol Bobko, Story Musgrave and Donald Peterson. Challenger returned to Edwards Air Force Base on April 9, ending the first of its nine successful flights before the orbiter was destroyed in an explosion shortly after launch on January 28, 1986 with the loss of seven astronauts. April 4, 1993 – The first flight of the Fokker 70, a medium-range airliner derived from the larger Fokker 100, both of which were developments of Fokker’s first airliner, the Fokker F28 Fellowship. The Fokker 70 was designed to fit a capacity gap between the smaller Fokker 50 or ATR 42 turboprop airliners and the larger Boeing 737 or McDonnell Douglas MD-80. The Fokker 70 is powered by a pair Rolls-Royce Tay 620 turbofans and can accommodate up to 85 passengers in a single-class configuration at ranges of up to 2,119 miles. A total of 47 aircraft were built before production ended in 1997, and they mainly serve shorter routes in Europe. April 5, 1996 – The first flight of the Lockheed Martin C-130J Super Hercules, the latest version of the venerable Hercules tactical airlifter and the only variant that remains in production. Upgrades incorporated into the J model include new Rolls-Royce AE 2100 turboprop engines with six-bladed composite scimitar propellers and digital avionics. The Super Herk enjoys a 40% increase in range, a 21% increase in speed and a 41% shorter takeoff distance compared to the E and H models. The J is operated by the US Air Force, Marines and Coast Guard, as well as numerous international partners, and 400 have been produced as of February 2018. April 5, 1976 – The death of Howard Hughes, a famous yet reclusive tycoon whose business interests included investments, filmmaking, and aerospace engineering. Born on December 24, 1905 in Humble, Texas, Hughes formed the Hughes Aircraft Company in 1932 and set numerous world records in the aircraft he produced, though he was not known as a particularly skillful pilot. He is best known for building and briefly flying the H-4 Hercules, popularly known as the Spruce Goose, the largest flying boat ever built, with the largest wingspan of any aircraft in history. Perhaps fittingly, Hughes died on board an airplane while flying as a passenger from his penthouse in Acapulco to Houston for medical treatment. In a fitting testament to his reclusive life, even the details of his death remain unclear. April 5, 1968 – RAF Flight Lieutenant Alan Pollock flies his Hawker Hunter under the top span of London’s famous Tower Bridge. Upset by the lack of an aerial display to mark the 50th anniversary of the founding of the RAF, Flt Lt Pollock of No. 1(F) Squadron protested by beating up (flying low over) several RAF airfields in his Hawker Hunter before turning towards London. There he circled the Houses of Parliament and saluted the RAF Memorial by dipping his wings, then followed that with a flight under the top span of the Tower Bridge, a feat that made him the first ever to fly a jet aircraft through the bridge. Pollock then beat up a few more airfields before returning to base inverted at 200 feet. Pollock was arrested, but never faced a court martial, as he was dropped from service on medical grounds before a trial could be held. April 5, 1959 – The first flight of the Aero L-29 Delfin, the standard Warsaw Pact jet trainer throughout the 1960s and the first aircraft to be designed and produced in the former Czechoslovakia. The Delfin is a simple, rugged aircraft designed to operate from unimproved runways and is powered by a single Motorlet M-701C turbojet which provides a maximum speed of 407 mph. The student and instructor are seated in a tandem configuration, with the rear instructor’s seat slightly higher. In addition to pilot training, the Delfin also served as a weapons training platform, carrying gun pods, bombs or rockets. A total of 3,500 were produced from 1963-1974. April 6, 1924 – The start of the first successful flight around the world. In 1923, the US Army Air Service requested that Douglas Aircraft Company develop an aircraft specifically for completing a circumnavigation of the globe. Douglas modified five Douglas DT torpedo bombers, and four of them departed from Sand Point, Washington and flew west. Owing to crashes along the way, only two aircraft completed the journey, which covered 27,553 miles and took 175 days to complete, landing back in Seattle on September 28 after making 58 stops along the way. The success of the flight helped establish Douglas as a major aircraft manufacturer. April 6, 1890 – The birth of Anthony Fokker. Anton Herman Gerard “Anthony” Fokker was born in the Netherlands Indies and was a Dutch pilot, aviation pioneer and aircraft manufacturer. During WWI, Fokker produced some of the most famous German aircraft, including the Dr.I triplane which became synonymous with Manfred von Richtofen, better known as the Red Baron, and the D.VII biplane fighter (which was designed by Reinhold Platz). Following the war, the Treaty of Versailles prohibited Germany from producing warplanes, so Fokker took his business to the Netherlands where he developed the famous Fokker F.VII Trimotor. Fokker moved to the US in 1927, but died of meningitis in 1939.